Often, people who see Khun Mae would enviably end up sharing with Khun Mae how their lives have been unhappy because of their spouse, children, boss, relatives, friends, etc. Khun Mae would patiently listen and then teach them skillful ways of dealing with their personal issues. For different people, Khun Mae would teach different methods- and 2 different person who have the same problem would be taught two different methods- according to their temperaments and conditions. But for those who have been following Khun Mae for sometime, Khun Mae made no allowance for us to start blaming any external factors for our own misery or misfortune. If we ever complain about another person, Khun Mae would question us back- why are we busy finding faults with others? Have we looked within? Of course, even for that, Khun Mae would normally provide explanation as to the other person’s behavior so that the miscommunication and misunderstanding can be cleared. One of the things I most respect about Khun Mae is that she would not judge someone through hearsay. She would make it a point to find out the truth of the matter. And she always give people chances. 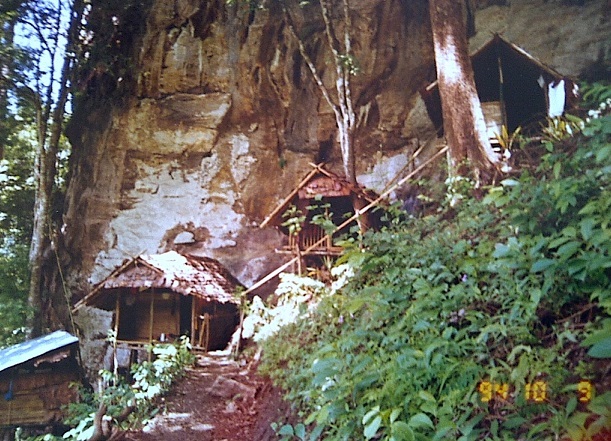 Kuti that Khun Mae (most right) stayed in the rains retreat of 1994 at Mae Hong Son. Once, Khun Mae shared her own experience when she first started out as a nun. She had left behind a lot of material comfort to follow the path of the Buddha as a nun. In the beginning, before she set up her monastery, she stayed in other monasteries for short periods of time in between her tudong practice (going to forest, cemetries and cave). During the very initial period, she was staying in this particular temple in which the mae chis (nuns) do not follow the precepts. They cook instant noodles to eat in the afternoon and spent time chatting and gossiping endlessly. Khun Mae who strictly try to uphold her practice, was at first aghast when she saw such behavior. To top it up, the noise make it hard for her to practice quietly and peacefully. Her heart was scolding and judging these nuns- ‘why did they do it?’, ‘why don’t they appreciate their chance to practice?’ ‘why they waste it all away’, etc. She felt miserable, upset and judgmental. Until one day, realization arose in her heart- that in fact, it was not other people that were making her miserable. Her mind wondered outwards instead of looking within. Instead of focusing on her own practice and looking inwards, she was focusing on the practice of others. She saw how her heart grasped on to external factors and take it in to form judgment that were making her miserable. In actual fact, no one was making her miserable. It was that her expectation that others should be like her- and when it was not as what she had expected, her heart were upset and angry. Realizing it, she no longer focused on external. When others ate in the afternoon, she made sure she did not follow them. When they are talking, she did not join them- she was on her own, cleaning up the temple. And at night, when everyone was asleep, she meditated under her umbrella tent (in that temple, they all sleep under umbrella tents). She did all this quietly on her own and those who stayed with her never knew. There was nothing to prove or ‘show off’ to others. Khun Mae said that because she had gone through so much, she was able to teach from her own experience on how to overcome problems. She said that if we constantly look outwards and judge people, it would be difficult to progress in our practice.